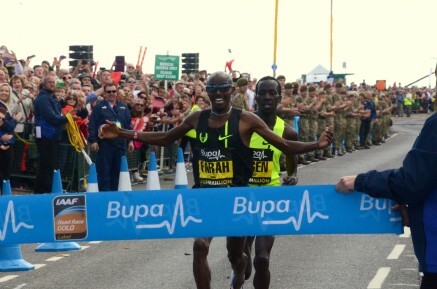 7th September 2014 – Double Olympic, World and European Champion Mo Farah (GBR) finished off his season in the perfect way by becoming the first British athlete to win the Great North Run for 29 years. Right from the start the pace was fast as one by one the big names dropped off the leading pack. By 5 miles the PACE trio of Farah, Kigen and Great Birmingham half marathon winner Thomas Ayeko (UGA) had broken away as Kigen continued to push the pace. By 10k passed in 28.19 it was down to Kigen and Farah as they continue to pour on the pace. Coming along the seafront with 400m to go Farah went to the front and used his superior finishing speed to hold off Kigen. Akeyo fought bravely for 3rd but in the end was passed by Kiprotich and Tariku Bekele eventually finishing 5th in a PB 62:13.